Azomite Granulated Natural Trace Minerals contain over 70 different trace minerals that are both essential and beneficial to all types of plants. Since these trace minerals are often deficient in soil and commonly neglected in fertilizers, Azomite provides a big boost in fruit and vegetable yield, flowering and overall health of plants. 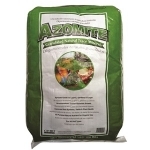 Azomite is certified for organic use on your lawn, garden, trees or field crops, and spreadable either by hand or with a broadcast spreader.